A Great War may be coming on Game of Thrones, but the writers on the eighth season premiere made sure to remind us of all the ground the show has covered over the years - particularly with regard to Theon Greyjoy. Near the end of the episode, Theon finally rescues his sister Yara from Euron Greyjoy's ship. The reunion is somewhat bittersweet, as Theon had effectively abandoned her last season despite her loyalty to him throughout his ordeal with Ramsay Bolton in seasons prior. But after a headbutt for retribution, Yara forgives her younger brother stating, "What is dead may never die." This phrase first appeared as the title of the third episode of the second season. In the episode, Theon's father Balon Greyjoy prepares to wage war on the North. 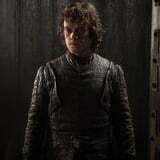 Theon suggests they'd be better off creating an alliance with the Starks, but Balon views the move as foolhardy. Yara insists such weakness is a sign Theon must choose where his loyalty lies - with the Starks or the Greyjoys. Theon considers warning the Starks, but ultimately decides to serve his father and undergoes a ritual baptism in the name of the Iron Islands' deity, the Drowned God. Part of the prayer from the baptismal ritual states, "What is dead may never die, but rises again harder and stronger."